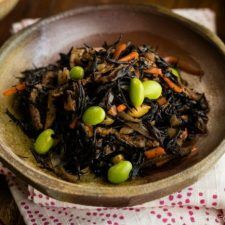 Today’s recipe is Hijiki Seaweed Salad, a traditional Japanese dish using a type of wild seaweed that is known for its many essential minerals and dietary fiber. Cooked in a savory sauce with other vegetables, this healthy salad has a delightful texture and homey flavor. Give it a try and you will come to appreciate this salad. Have you heard of hijiki before? Yes, I’m talking about this strange looking black ingredient in this dish. Hijiki seaweed is a type of wild seaweed that grows on rocky coastlines around Japan, Korea, and China. 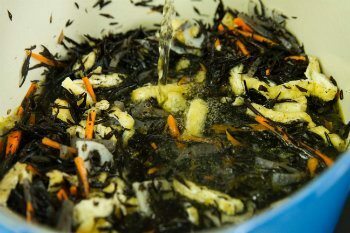 If you haven’t seen hijiki seaweed before, the first impression might be unappetizing. 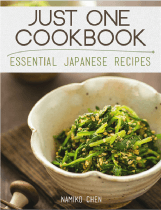 While I was hesitant to share this dish on Just One Book because of how it looks, there was someone I met who was passionate about this dish and has been promoting this traditional Japanese ingredient here in San Francisco. 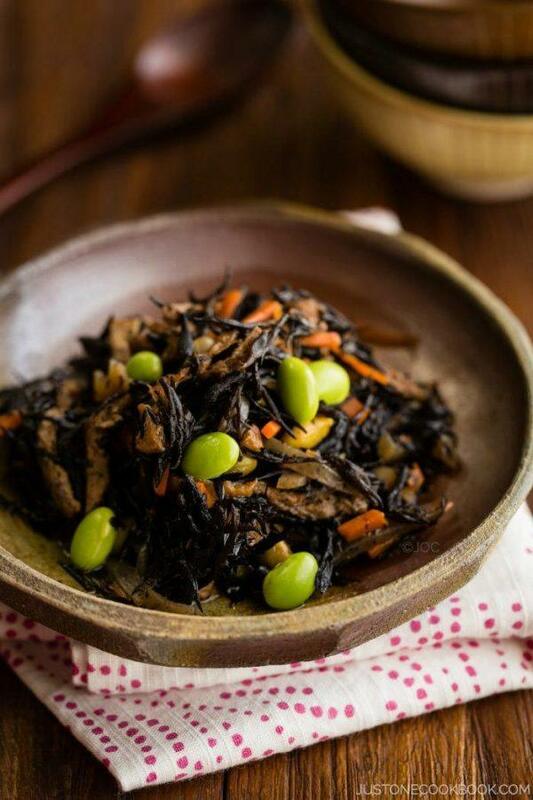 Healthy hijiki seaweed salad cooked in a savory sauce with carrot, edamame, aburaage, konnyaku. Back in January, I was invited to a Japan Food Festival hosted by The Ministry of Agriculture, Forestry and Fisheries (MAFF) of Japan (農林水産省) at the residence of the Consul General of Japan in San Francisco. The event was to promote the trending Japanese ingredients and seasonings (such as shio koji), and chefs from the top Japanese restaurants in San Francisco showcased their original tasting menu items using Japanese ingredients. At the reception, I had a pleasure to meet Mr. Iwata (Iwata-san), the owner of a Japanese-style delicatessen DELICA at Ferry Building in San Francisco. We were talking about the Japanese food in the Bay Area and how it has transformed over the past 10 years. 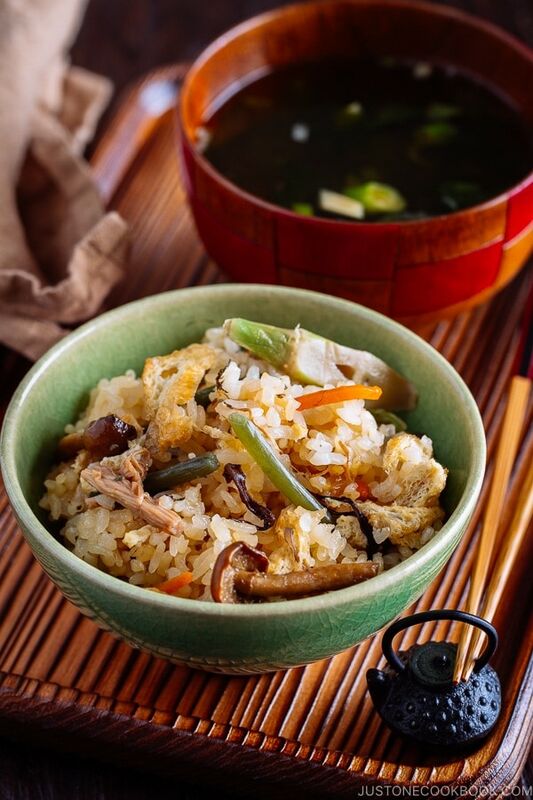 There are a lot more Japanese restaurants in the area that serves a variety of Japanese food. We also discussed how we can introduce real Japanese food (that we actually eat in Japan) to people in the Bay Area. While we were talking about Japanese ingredients that are still unfamiliar in the U.S., Iwata-san told me a story about using hijiki in one of his menus and how his customers responded. He heard many customers saying they can’t eat something look like worms. 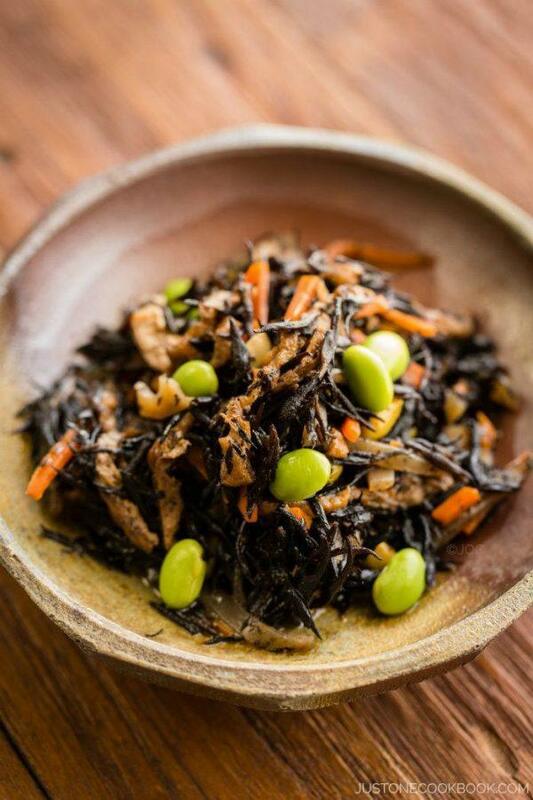 However, Iwata-san was confident that people will like it once they try it and kept serving the hijiki seaweed salad. Now it has become really popular and it’s one of their signature lunch items. 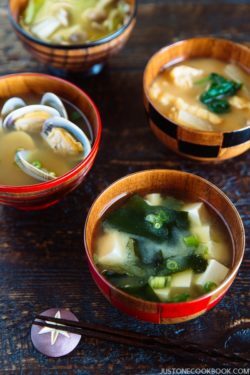 When I mentioned to him that I had been scared to introduce hijiki seaweed on my blog for this same reason, he encouraged me to promote this traditional Japanese dish and healthy ingredient. Hijiki seaweed actually is green or brown in color when fishermen and divers harvest in the wild. It is boiled and then dried, and this process turns hijiki black. 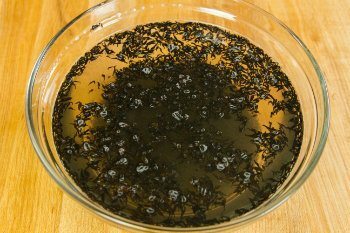 So when you buy dried hijiki seaweed (found at Japanese supermarkets, Asian grocery stores, and natural food stores), you always need to soak in water before cooking. 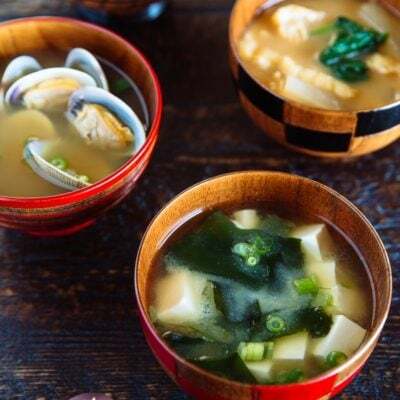 Hijiki contains dietary fiber and essential minerals like iron, calcium, and magnesium and this traditional food has been a part of a balanced diet in Japan for centuries. 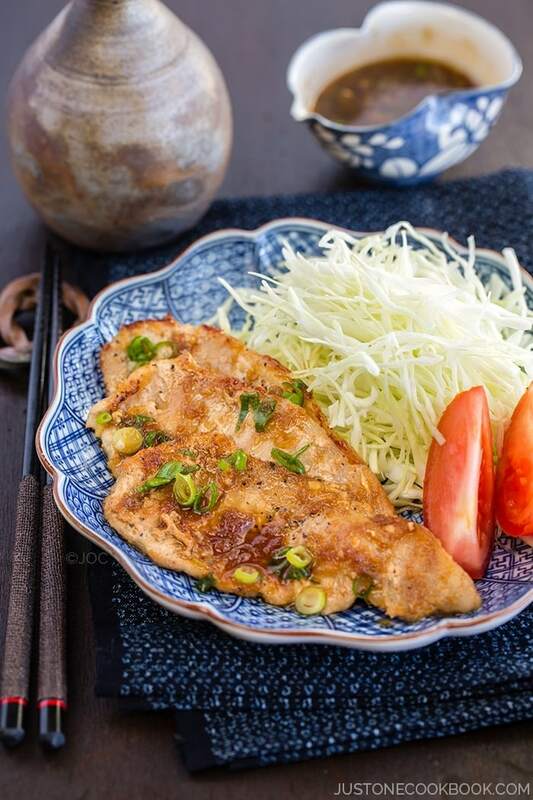 One of the most common hijiki dishes is this Hijiki Salad, where hijiki is cooked with vegetables, konnyaku, and other foods in soy sauce and sugar. I really like how my mom cooks her Hijiki Salad, and this is close enough to how I remember how she cooks it. With this, I hope you give this recipe a try and let me know how you enjoy the flavor. 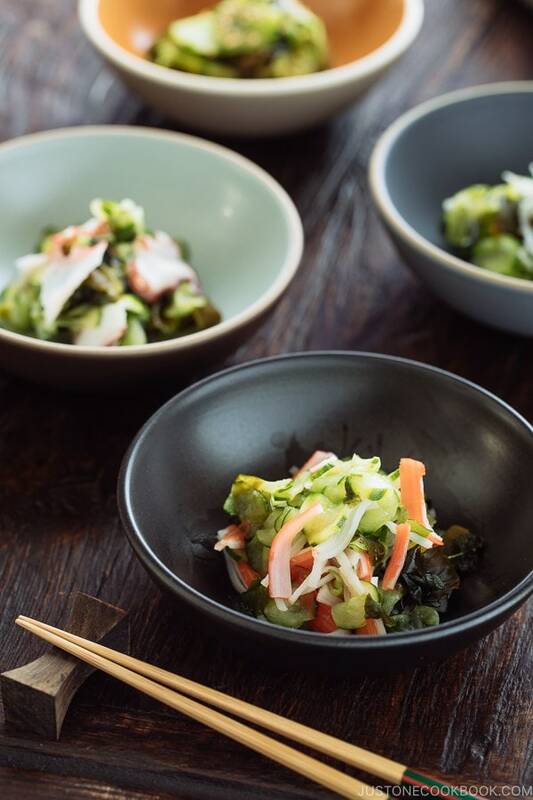 Today's recipe is Hijiki Seaweed Salad, a traditional Japanese dish using a type of wild seaweed that is known for its many essential minerals and dietary fiber. Cooked in a savory sauce with other vegetables, this healthy salad has a delightful texture and homey flavor. Give it a try and you will come to appreciate this salad. Soak dried hijiki in 4 cups of water for 30 minutes. Drain to a large fine sieve and wash under the running water. Boil water in a small saucepan and pour on top of aburaage. This will remove the oil coated on the aburaage (manufacture’s oil doesn’t taste good, so this extra step will improve flavor of aburaage.). Cut in half lengthwise and slice thinly. Add water and konnyaku in a small pot and boil for 3 minutes to remove the smell. It also makes konnyaku absorb flavors more and improves the texture. Cut the carrots into julienne pieces. 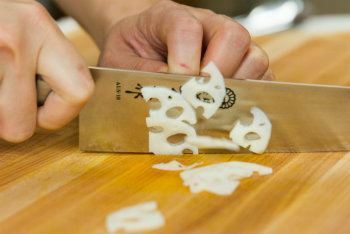 Cut the lotus root into thinly pieces. Heat oil in a medium pot over medium heat. Add carrot and lotus root and cook until they are coated with oil. Add the hijiki, then konnyaku and aburaage. Mix all together. Add the dashi and let it boil. Add all the seasonings and mix well. Cook covered on medium low heat. After 30 minutes, add the edamame. Cook uncovered to reduce the sauce until you see the bottom of the pan. Put the leftover in an airtight container and keep in the refrigerator for up to 3-4 days. It might be hard to find optional ingredients. In that case, replace them with other ingredients you like. I think I’ve had Hijiki before in Japan, but did not know what it was. And from your recipe, it is easy to do and if memory serves me right, it’s quite delicious. I know some vegetarian bloggers who will enjoy this. Thanks for sharing, Nami. How nice of you to take the time to visit my blog with your support. Have a good week ahead! I don’t think it looks scary or unappealing…I think it looks delicious, and fantastic, Nami! Thumps up for the video…I enjoyed watching how you make this healthy and simple salad. I wish I could find it here and make it myself! It’s the same in DC! Last summer I didn’t see any hijiki, but now it’s on some of the more authentic menus, definitely the izakayas. I’ve played with hijiki a bit this semester. Although I make it in a more traditional way now, my first try was a stew with parsnips and yams! It was DELICIOUS combining the salty and sweet! I’ve not heard of this. And when I really look at the pictures, it does look a tad weird — but really, my eye is drawn to the color of the edamame (garnish is so important in food photography, isn’t it?). Definitely something I should try sometime — if you say it’s delish, I believe you! I love hijiki salad!! When I went to school in japan this was one of my favorite dishes!!!! Hi Penny! You’re welcome! It’s a very common home cook meal, and a lot of us grow up eating this dish. 🙂 Yes, hijiki needs to be cooked before using it. 🙂 Thank you for your comment! Ok, I need to find hijiki in New Zealand now!! I love eating seaweed, I ate so many types in Japan (this one too probably, but I am not sure…) and it is truly amazing food. In fact I don’t like the English name seaweed, it should be sea vegetables! In Italian is Alga (algae) more logical to me, although I think a lot of people don’t find that word appetizing. But they are so delicious!! Thank you so much for this nice dish. In Paris in the Japanese neighborhood, there are restaurants typical Japanese restaurants and some Japanese supermarkets. Unfortunately the product sold there are a bit expensive and are not often explained to the customers. I am always frustrated to be in front of vegetables for example and to do not know how to prepare them. 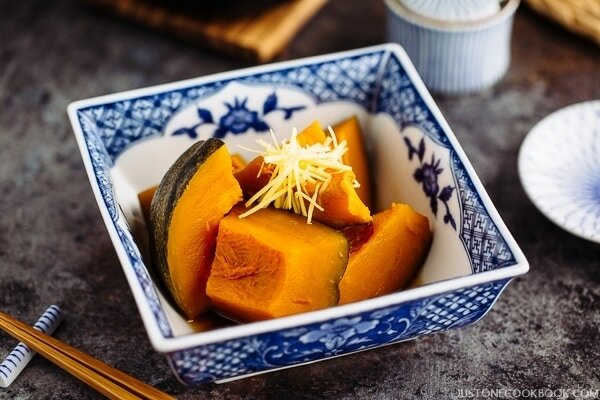 Do not hesitate to offer us traditional Japanese recipes, we will give it a try too. What a delicious salad! Sounds interesting. I’m so glad you posted this recipe, Nami. Hijiki is one of my favorite things, but I always buy prepared. It will be nice to adjust the seasonings. Beautiful, colorful, healthy and scrumptious! A great salad. So many unusual ingredients are so nutritious and delicious. I love learning about things like this. I like how you added pops of color to the dish. I think I would like this very much…looks terrific to me, Nami. I LOVE hijiki!! I kept eating it for breakfast at the breakfast buffets in Japan. I like adding it to my rice congee hehe. Thanks for sharing the recipe! Def going to make this! This one’s going to end up in our house at some point. Looks delicious. 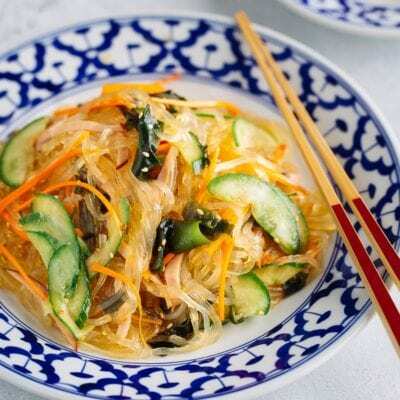 I love the use of the lotus root in this salad and it is so beautiful. Dark colors can be just as appealing as bright ones and you proved that with this dish! You are so creative and I love all the extras you are doing with your posts like the videos and such! Keep it up! I just discovered your site and I love it! I returned yesterday from a trip to Japan. The first half of my trip was spent with a Japanese vegetarian man. We ate so many wonderful things. Your site is a great resource. Thank you for sharing so many recipes. I have seen and eaten touches of Hijiki before in restaurants but I had n idea that was the name. And it is so nutritious. A perfect paring for this gorgeous salad too. 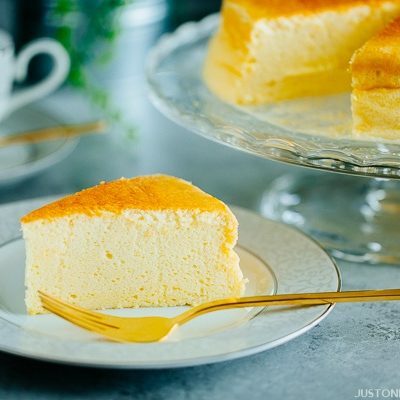 thanks for sharing your Hijiki recipe on your blog. I got to know hijiki Seaweed from a Japanese friend. After trying hijiki, I liked it a lot. However, I have read on the internet that hijiki contains certain a high level of Arsenic. And I really looked up on the internet. Unfortunately, some food agencies in UK even advice consumers do NOT eat Hijiki seaweed due to this reason. Please see the link i attach. I also told my Japanese friend about what I read. After looking on the internet, he said that he agrees with me. So I am actually not quite sure about whether it is okay to eat Hijiki or not. Hi Judy! Thank you for sharing the information with us! I also read some articles too. It looks like if you don’t eat A LOT of hijiki EVERY DAY, the risk is not high. I think this is an issue when you consume so much hijiki… but no one really eat that much hijiki anyway. 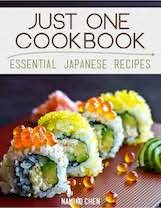 So the basic summary I learned from reading was to eat hijiki occasionally then it doesn’t affect our health. Nami, I’m glad you shared the recipe. People all have different tastes and we just can’t appeal to them with all of our recipes. I don’t think it looks like worms (crazy) and think it looks quite appetising — but I love to try new foods. :) Great recipe and video! Come visit me @ gemmachew.com ! I have always enjoyed seaweed and this salad looks delicious! Interesting dish I’ve never come across before. Do they serve this in jap restaurants? Hope I get to try it one day. Looks healthy and delicious! People are nowadays as fussy with food as small children! I would never guess hijiki might look not appetising… Your salad looks amazing (and there are also my beloved edamame!). I’m ashamed to admit I have had hijiki for at least two years and never used them. I simply haven’t stumbled upon any recipe and forgot I had them, so I’m thrilled to see you have decided to post a dish with them. Thank you, once more, Nami! My first time having seen this dish, looks delish! Looks delicious! I found Hijiki in a Japanese shop in Amsterdam. I used it like wake me. That was not a great succes, but now I understand, it has to be boiled much longer! My personal choice is to cook hijiki with rice (Takikomi gohan – rice season with soy sauce, mirin, sake, etc). I hope to share the recipe one day. Also, I add it into “Chicken Meatballs” recipe, instead of colorful bell pepper. So delicious! Hope you give these recipes a try! 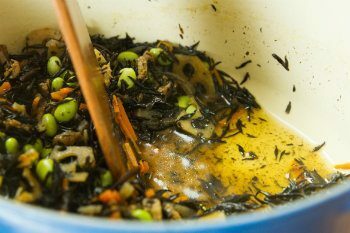 I’m always looking for more ways to get seaweed into my diet so I’m happy to see more seaweed recipes! Nami when I first arrived in Japan I saw hijiki salad and had no idea what it was but I bought it. I have enjoyed it ever since! It’s quite unlike anything else really! I love Hijiki! I love this dish too much, I can eat it with a huge bowl of rice!! 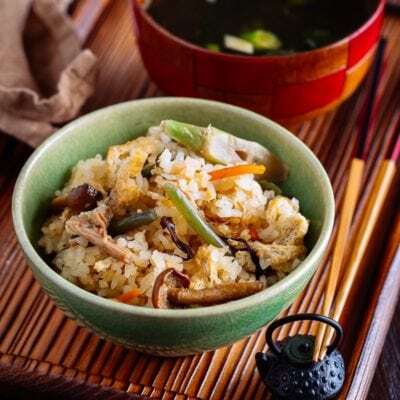 If there were only Hijiki and cooked rice in the house, I will be happy to eat them for dinner or lunch…or breakfast! Hi Ayako! Me too! Use ingredients you have. I sometimes just use carrots and aburaage besides hijiki. 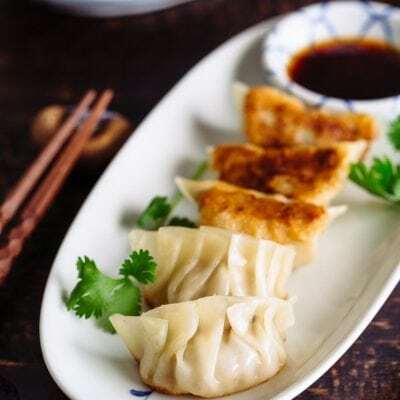 🙂 Aburaage or small pieces of pork slices give nice flavor. 🙂 Thank you so much for your kind comment! 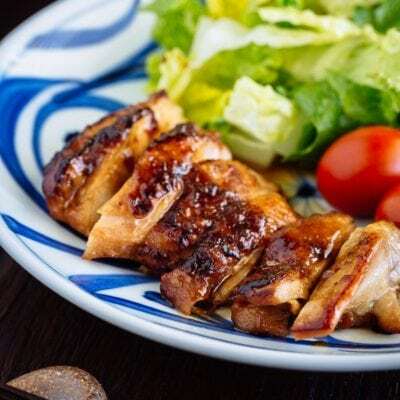 I love hijiki salad Nami – can’t wait to try your recipe! Hi Nami! I love all of the ingredients in this salad. I especially love seaweed and can’t wait to try the Hijiki seaweed. Looks very healthy and full of nutrients. Ooh, I think I’d be all over this – I don’t think I ever heard of or had it before but it looks lovely. Worst case scenario I could pick out the edamame, lotus root and carrot, but I guess the rest is delicious! I had a hijiki salad somewhere, but it was just carrots and hijiki in a seasoned sauce. I like that you added edamame for color and protein! I had this dish in Japan for breakfast. I loved it. Don’t be afraid to post, this is what makes your blog different. Keep posting traditional Japanese dishes. Thank you for your beautiful and useful website. I used your hijiki no nimono and inarizushi recipes to share my love of Japanese food with my friends here in Southern Germany, where i am living right now. 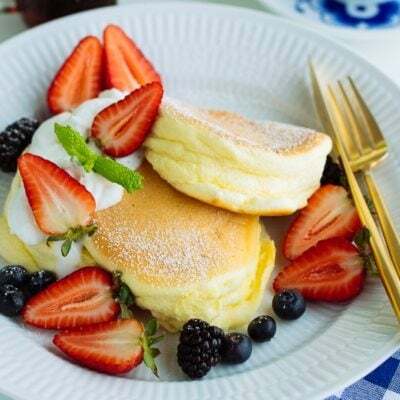 I had just returned from a visit to Tokyo to visit my former exchange students, and the tastes were just like my “daughters” made for me during my visit. Everyone loved the food, and I have translated your recipes into German, with a link to your website so they can enjoy the pictures, plus directions to the little Japanese grocery store that I visit in Munich. This recipe looks great except for the addition of white sugar. I’ve soaked my hijiki in water and then simmered it down in apple cider (juice, not vinegar) and it gives it a delicate sweetness without the sugar burn. I’ve noticed that a lot of your recipes have sugar added to them. Would it affect the taste much if I omitted it? Nevermind, I just saw Susy’s response! I’ve just ordered Hijiki in the internet since it’s nowhere to be found! When I was in Japan I always ordered a portion of this salad at Sukiya. Of course then I didn’t know neither how it was called nor what the ingredients were… Thank god I found your recipe!!! Quick question… How do you cook edamame exactly? Here we can only buy them frozen. Hi Alina! Happy to hear you like this recipe (I know it doesn’t look so appetizing!). If you get frozen edamamae, follow the package instruction. But usually you need to boil for a few minutes and drain. You can then remove the edamame from the shell. 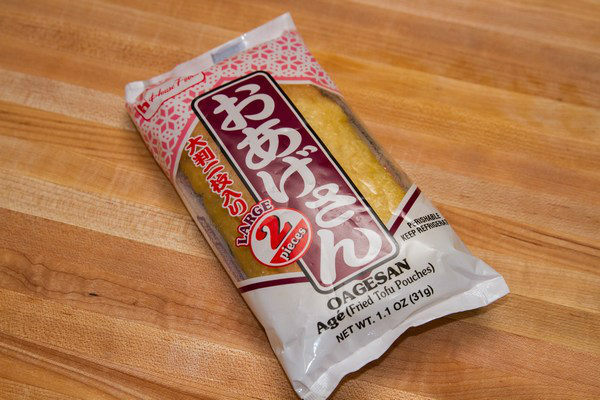 I was so surprised to find out that my very fussy eater 4 year old son loves hijiki! He leaves the rest of the salad ingredients on his plate but loves to eat the hijiki part, especially when it is mixed with some rice. Made your hijiki salad few days ago. 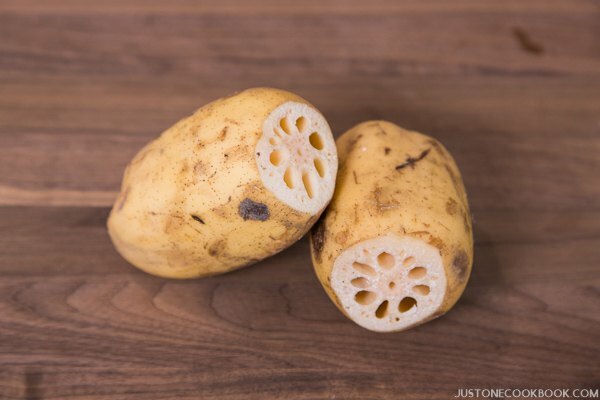 I love hijiki, but I’d never put lotus root in it before. It was so good! Thank you! I love Hijiki salad but have only had it in Japanese restaurants in Singapore. Bought a bag recently, searched your blog & found your recipe. Made it last night knowing I will not be disappointed. Hubby looked at it suspiciously, took a small bite & his eyes lit up BIG time! After a few more dips, he declared, “oh my, this is addictive!” It’s a keeper! Thank you Nami, for sharing your wonderful recipes. I love your recipes because they are authentic yet easy to follow. Keep up the good work! Hi LayChin! Aww I’m so glad your husband liked this dish too! Now you can make more often. 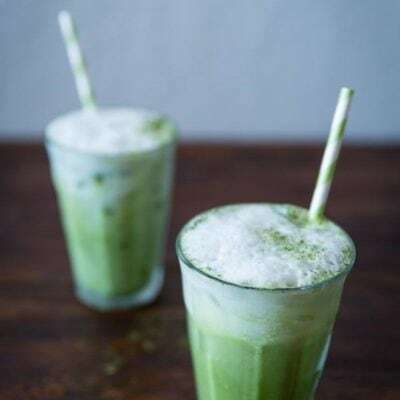 😉 It’s much more economical making this at home than ordering at a restaurant (and you can adjust the flavor as you wish). Thank you for your kind and sweet comment about my recipes. I’m just so happy that you are making this dish at home! And your husband reaction….. hahaha… I don’t share hijiki much on my social media because it is hard to convince people this IS a good dish with black seaweed. LOL. Hi,I really like your post,there is a question keep confusing me,I’ve had a dinner at a Japanese restuarnt before,I orderd a seaweed salad,but this type of seaweek is a little bit different from I’ve had before,it looks more green and crunchy than normal seaweek,I really like this,then I bought the seaweek in Japanese shop,but it is NOT waht I had in the restuarnt,I was so disappoited,so I’ve try to search in google to find out what type this seaweed is,but it seems no point,it is only called seaweed in google.I think I need you to help me find out what type of this seaweed is.At last here is a photo I got in google,because I can not attach a photo here,I hope you can understand clearly what I say.Thanks a lot! Hi Yumi! Thank you for reading my blog! 🙂 I wrote about this seaweed salad in this post. I have a question about hijiki. I am looking for a hijiki that is more tubular in shape . I can find the hijiki that is very fine in dry form, and when hydrated, looks quite thin. I bought a type that is larger and more tube-like and was more tasty. I can not find it again, and was wondering if it has a different name. I love hijiki salad. 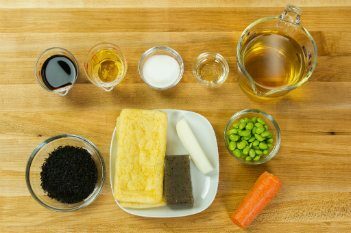 I don’t know if I will be able to find the ingredients here in Colorado, but thank you so much for posting the recipe! You keep knocking them out of the park with your recipes. Every time I think you can’t top the current recipe I’ve tried, you prove me wrong. We have loved every one of them (and I’ve made a LOT so far!). Should this hijiki salad be served hot/room temperature/cold or is it great at all temperatures? Looking forward to trying this one out as I’m trying to add more seaweed (nori, wakame, hijiki, konbu), edamame, and konyakku to our diets. Thanks for all of the wonderful recipes. My 84-year-old mom will often say “Grandma used to make this.” so they bring back nice memories for her too. Regarding the temp this dish should be served… my personal preference is cold. It’s sweet and savory dish that I enjoyed it chilled. I tend to eat a bit too much when it’s cold. I also like it hot if I put some of it on the rice and eat together. Basically it works great for all temp (hijiki in bento is often served at room temp). I’m so happy to hear your mom enjoys this dish. We do remember food we grew up eating and it brings so much joy and comfort especially as we get older (I’m talking about myself…. 🙂 ). Finally got around to cook from the hijiki brought back by a good friend. I loved the taste as it’s way better than some of the thicker seaweed I’ve tasted in Taiwanese cooking (they usually use the knotted kind). Those tend to be flavourless and just used as a filler for a dish. I also like the texture of hijiki as they were soft and not “ligament”/chewy/crunchy like. Don’t know if it’s the correct texture or have I overcooked it? I made dashi using your recipe and then followed your hijiki recipe but since I didn’t have lotus or konnyaku or aburaage so I put a bit more carrots and edamame (didn’t do any exact calculation to compensate for the missing items). I found that my carrots lost its vibrant colour as I was cooking and later on after the 30 min mark, I put in the edamame, they lost the green colour as well. I still had a lot of water left so I continued and then up to a point, I decided that was long enough and stopped cooking. I still had some liquid left but was less than when I started after adding the edamame. What am I doing wrong? Have I overcooked them? How can I correct it for next time? 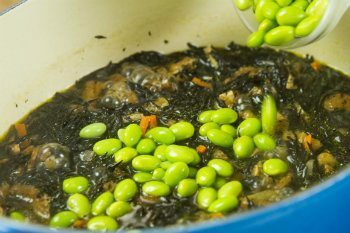 My mom made something similar, but she used (cooked) dried soybeans instead of the edamame. 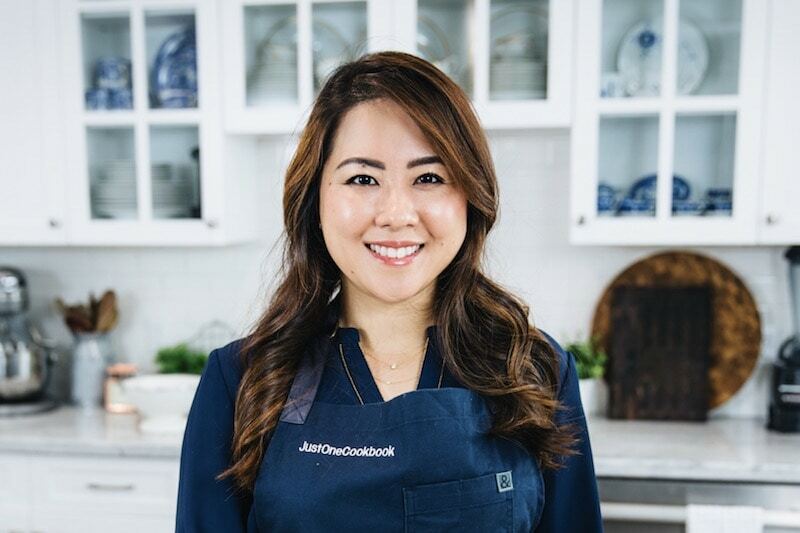 Can’t wait to try your recipe…it sounds easier than hers! thank you for this recipe. we just got back from japan and i was dying to know how to recreate this!! we stayed at a ryokan and had it several times but due to the language barrier i could not know what it was until now! Hi Grace! Aww I’m so glad you finally figured it out. 🙂 Hope you enjoy re-creating this recipe at home! 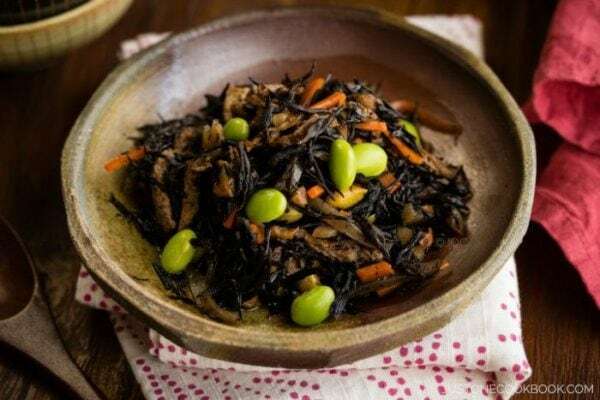 Recent research show inorganic arsenic contained in hijiki exceeds the tolerable daily intake for human being, thus it might not a healthy seaweed salad as other seaweed, like Goma wakame? Hope receive your reply for my question? I love seasoned hijiki. I am glad to find your recipe. Hi Nami! So I live in NYC and had hijiki seaweed several times from the local Japanese deli and really liked it. However, I’ve read articles about UK and US food authorities warning about the arsenic content in it that might lead to cancer. Just curious how you or people in Japan think of it as a concern or consider it’s safe to eat on a regular basis?